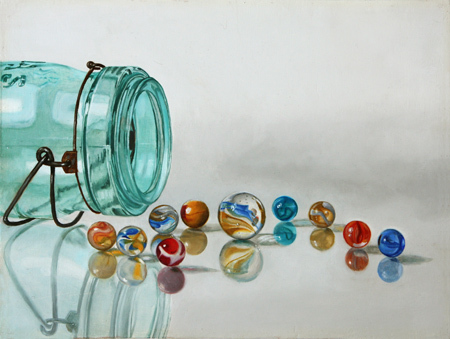 I recently returned the painting to the easel and reworked several of the marbles and the shadows. The changes are not drastic and I’m probably the only one who will notice but I like the painting better. This entry was posted on June 28, 2011 at 9:04 am and is filed under art, art for sale, oil paintings, photorealism, realism, still life, vintage toys. You can follow any responses to this entry through the RSS 2.0 feed. You can leave a response, or trackback from your own site.